The United States Mint has completed production of the 2006 San Francisco Mint Commemorative coins. Public Law 109-230 mandated the striking of both silver dollar and five dollar gold coins to honor the old Mint's place in history, in particular its role in helping the city of San Francisco recover following the devastating earthquake of 1906. The San Francisco Mint was first established in 1852, in response to the need to convert California gold rush discoveries into coinage. 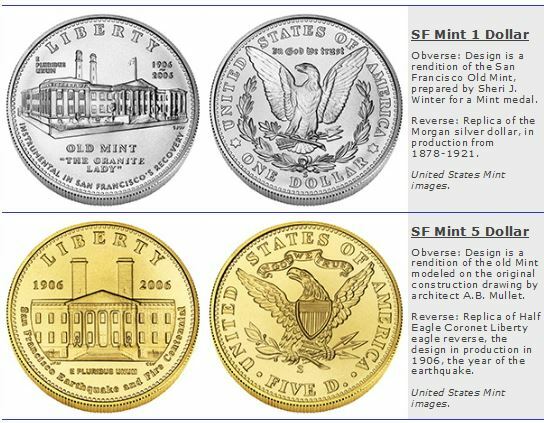 The first mint facility was quickly outgrown, giving rise to the building depicted in the 2006 San Francisco Mint Commemorative coins. The "Granite Lady", as the second SF Mint came to be known, first struck coins in 1874. Because of her superior structural design, the Granite Lady remained standing following the 1906 earthquake. The Mint was the only financial institution capable of functioning immediately after the disaster, and served as a clearing house for relief funds, helping the city to get on its feet much quicker. Surcharges earned through the sale of the San Francisco Mint Commemorative coins went to help recondition the Granite Lady and create a museum dedicated to United States numismatics and the California Gold Rush. Collectors wishing to buy San Francisco Mint commemorative coins can find them on eBay coin auctions.